There’s no denying it. The vast majority of workers won’t be ready financially for retirement. Seventy percent are behind schedule in saving for retirement and half of all Americans have less than $10,000 in savings. Of immediate importance is the fact that nearly half of the oldest boomers are at risk of not having sufficient retirement resources to pay for basic retirement and healthcare costs! 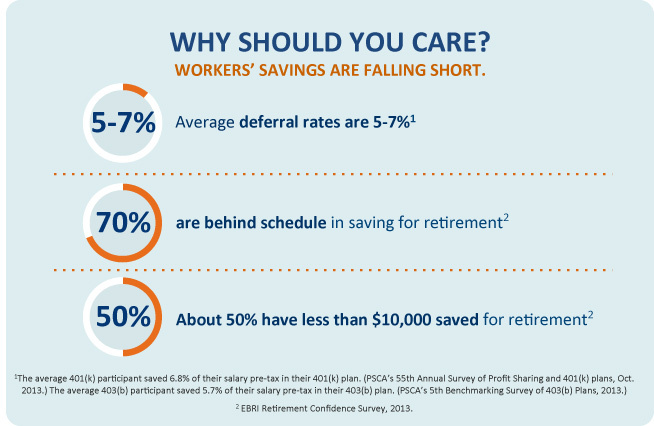 Why should you care about retirement readiness? The answer is simple: Because retirement delays can hurt your bottom line. In addition, the cost of employees working beyond the normal retirement age can have potentially significant implications for your business as a whole. So how do you know if employees are saving enough, and how do you measure success? Simple plan design changes can have huge impacts on participant outcomes. Features like automatic enrollment and automatic deferral increases, for instance, use participants’ inertia to their advantage. 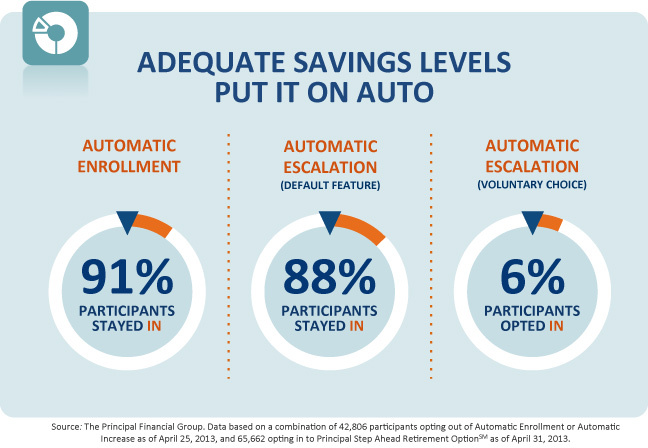 In fact, 91% of participants stay in the plan when automatically enrolled. And 88% of employees participate in an automatic escalation program when it's a default feature—only 12% opt out. But when they have to sign up on their own, just 6% participate. UBA, in partnership with Principal Life, are hosting the complimentary webinar “Breaking Through the Barriers to Create Retirement Plans that Work for Everyone” on Thursday, June 19, 2014 at 2:00 pm EDT / 11:00 am PDT. To register for the webinar, visit UBA’s WisdomWorkplace webinar series at http://bit.ly/1hzjaTW and enter code UBAPFG to receive the complimentary $149 discount.